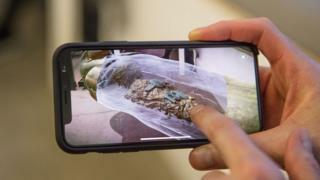 The BBC is launching an augmented reality app that will enable people to explore historical artefacts from UK museums in virtual exhibitions. It is a companion to BBC Two's Civilisations series, which will be broadcast in spring 2018. Users will be able to view and explore artefacts virtually - for example, looking at a mummy inside a sarcophagus. Other broadcasters are also experimenting with the technology. Sky ran an AR-based marketing campaign last year to promote its Q TV service, allowing consumers to interact with virtual versions of characters from its shows at a London station. AMC created a video game to promote the Walking Dead that superimposed zombies over smartphone camera views of the real world. And during last week's Super Bowl, NBC featured augmented reality graphical representations of players that it superimposed over views of the US Bank Stadium. The Civilisations AR app is being released on both iOS and Android. It was developed internally by the BBC Research and Development team based in London. Its interactive features include allowing users to "rub" through layers of history to revive a faded sculpture to what it would have looked like when it was first made. Developers are becoming more interested in creating augmented reality products, in part because software kits were released for the iOS and Android operating systems last year that make it easier to deliver advanced features. "What Apple and Google did has made a huge impact," Gartner analyst Tuong Nguyen told the BBC. He added that AR presents an entertaining way to share information, and has the potential to be useful across a wide range of industries. But he added that it could take years to reach its full potential. Video What future for augmented reality?